Earn one point for every dollar you spend with your card. Earn an extra $10 for every 300 points you obtain. Get 10% off on any in-store purchases made on your birthday. Cardholders also receive exclusive coupons and offers via email. 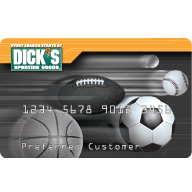 After opening an account, receive 10% off your first in-store purchase with your card. APR of the prime rate plus 26.74%. Either $10 or 4%, whichever is greater. The late payment fee can be up to $35. APR of the prime rate plus 23.74%.